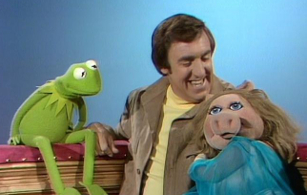 The Jim Nabors episode of The Muppet Show is a rather weak one, even by first season standards. 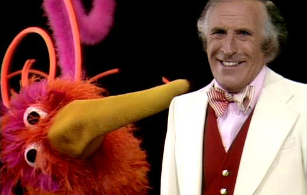 Although a pleasant-enough guest, Nabors fails to really connect with the Muppets on screen, more often than not feeling like he’s acting alongside rather than really with them. You’d think someone who played as colorful a character as the classic country rube Gomer Pyle on The Andy Griffith Show and then on his own show would be a natural, cartoonish fit for the Muppets, but he never really seems fully comfortable with them, which is ironic given that, in the Talk Spot, he claims that he feels right at home with all the barn animals around, as he grew up on a farm. 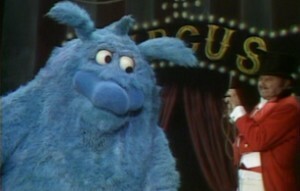 Maybe it’s just anthropomorphic ones he’s having trouble wrapping his head around. 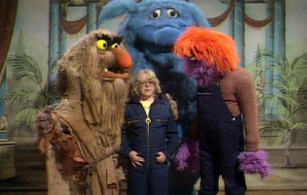 You might notice that I seem to have jumped from episode 4 to episode 10 of The Muppet Show, and while that is technically true, there is method to my madness. 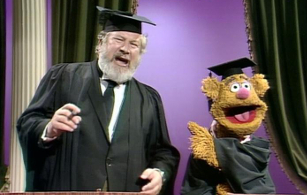 The Muppet Show wasn’t always aired in the same order in which it was produced, and airing order even varied from country to country. 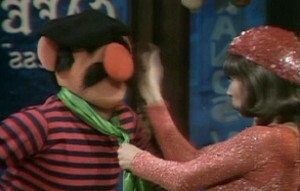 In this case, although the official episode number is 10, it was actually the fifth episode produced, and since one of my main goals with this site is to track the evolution of the Muppets, I decided to stick to production order, particularly in the first season, where characters, sketches, and the show itself really was developing week to week. Princess Ruth Buzzi romances Sweetums. 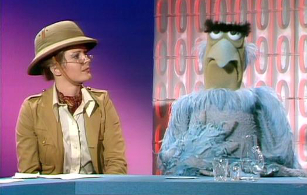 Ruth Buzzi, famous at the time for being a regular on the sketch comedy show Laugh-In, is the first Muppet Show guest who seems to really jibe with the characters and the show’s sensibility (it’s no wonder she would later be a regular on Sesame Street). 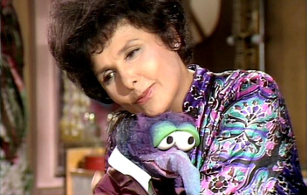 You can tell this right off the bat in her first song, a rendition of the classic “Can’t Take My Eyes Off of You,” which isn’t only the best musical number on the show up to this point but the best Muppet/human-guest interaction, full-stop. 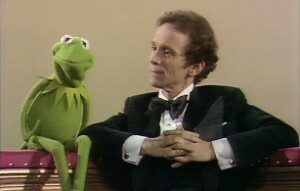 Kermit chats with Joel Grey. 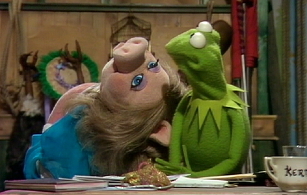 The third installment of The Muppet Show (currently available on DVD) features a lot of firsts. For starters, it’s the first episode of the show to have been filmed during the show’s regular production schedule, beginning in May 1976. The Juliet Prowse and Connie Stevens episodes were shot as test episodes in January of that year in advance of the show starting in earnest. It’s also the first episode where the guest is a man–star of stage and screen Joel Grey–which incidentally also marks the first time Kermit doesn’t flirt with the celebrity! In fact, it’s the exact opposite. If anything, Kermit gets a bit testy with him, and the feeling is mutual, albeit both in a comedic way. 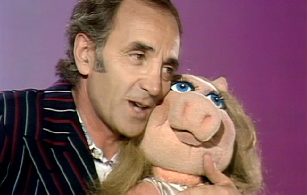 Kermit dances with Lydia the Tattooed Pig. 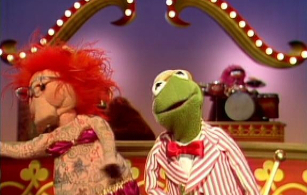 The second episode of The Muppet Show (available on DVD) was actually the first one filmed–sort of. 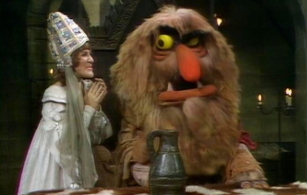 Before the main season began filming at London’s Elstree Studios in May 1976, Jim Henson and Co. flew to London in January to shoot two test episodes, the first of which featured Connie Stevens and the second, Juliet Prowse. After finishing them and receiving feedback, however, they largely reworked them. While the spots with the respective guest stars remained intact, other sketches were reshot with new scenes, shuffled around, and so on and so forth to the point that the new episodes definitely belong in the reverse order slot, particularly due to continuity bits that now progressed from one to the next.